Hello dear friends. How are you?! It feels like an age since I’ve been here. Maybe it has been an age. I’ve lost all track of time as we’ve been in a blur of activity and change. I meant to come back with a roar, with all sorts of things to say and stories to tell. Instead, I think I’ll go for something more along the lines of a purr. Roaring takes too much energy for the moment. Shifts and adaptations, however positive, are tiring. So is moving and unpacking boxes. Sheesh. But we are, in fact, wondrously unpacked. We still have a small stack of boxes to attend to, and the art needs to be hung. But, most of the important things (read: kitchen and dining room – and even the living room, actually) are set up and functioning. We had the most amazing help. I mean really, that’s part of why we wanted to be here. The kindness and sense of community are palpable. Most people just kind of walked around us when we moved into our last place in Boston. Here, we had a steady stream of smiling people stopping by to help unpack boxes, unwrap dishes, deliver pies, and bring us meals. While we were on our long drive, I worried that perhaps my expectations were too high, that I had overbuilt all my memories of how great Minnesota and its people are or how supportive our community would be. What a silly, silly worry. Reality exceeded expectations and then some, as it is wont to do if you will let it. No sooner had we started to settle into our new place than we picked up to head even a bit further north to spend the long weekend in the Northwoods with friends. We swam, and hiked, and paddled, and napped, and played games, and ate delicious meals until we were fit to burst. And then, to further crown the glorious weekend, our naturalist friends took us to a beautiful bog to pick chanterelles. Seriously. Does life get any better than that?! My one teeny tiny regret is that I – space cadet that I currently am – forgot to bring either camera or phone. So, no images from the weekend were captured. So be it. They’ll have to live on in the mind’s eye. Now we’re back and blam! back to work. The ground has been hit, and we are running. But we are being intentional from the start in our effort to work hard in a way that is still life-giving, with plenty of energy devoted to place an to nature. How can we not when there are trails to be run, hawk migrations to be watched, and the world’s largest lake to be jumped into! A critical part of this balance, for me, is getting back to cooking. It’s kind of been a while! We’ve experienced so much generosity with our arrival that we’ve barely had to be responsible for our own meals in over a week. I feel weirdly rusty in the kitchen. I’m also adjusting to the new space, new appliances, new light (I love our new place, and the kitchen is beautiful, but I must admit that it doesn’t get quite as much light as our last one). An extremely exciting development? Our new freezer fits our ice cream maker. Wee! Our old one didn’t. This didn’t prevent me from making ice cream on occasion, but the process was an involved series of hacks. Now, on the other hand, it’s a breeze. The breeziest of breezes. And good thing too because I had an ice cream recipe to test! So I went rogue, and made some changes to create my own version. I slightly reduced the amount of plum jam blended into the ice cream, and then added a jammy swirl to the finished ice cream. I added the bourbon to the ice cream base rather than the jam, allowing the sweet butterscotch tones to come through a bit more strongly. I also left some of the skin in while making the plum jam to give it a rich red color. 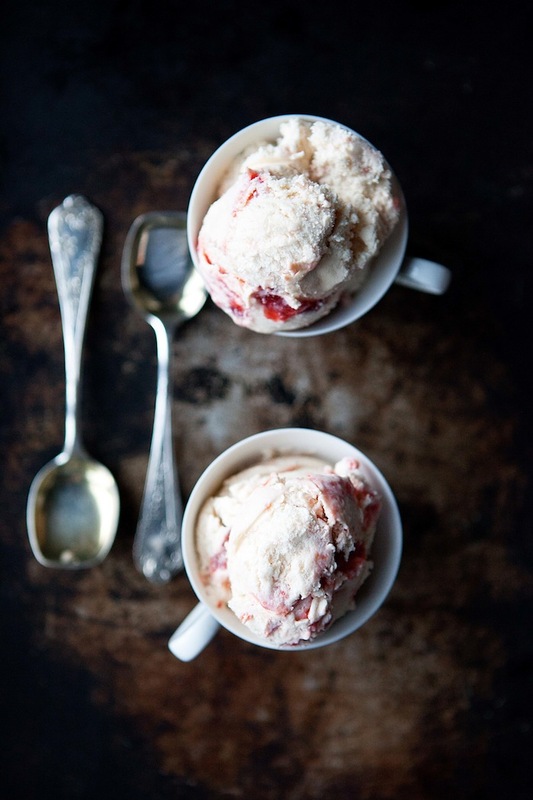 The tang of the plums and the floral notes of vanilla stand pertly up to the mellow creamy of the ice cream backdrop. The ice cream is cold but creamy, fresh from the fruit but deeply and richly flavored from the cooking process and the bourbon. It’s a treat that oozes summer while dribbling a bit into fall. And, it’s proving to be a happy welcome into a new home. Using a sharp knife, cut an x through the skin on the bottom of each plum. Bring a pot of water to a boil and plunge the plums in for 1 minute. Remove them with a slotted spoon, let them cool, and peel off the skin. In a heavy bottomed saucepan, combine the sugars, honey, and 1/2 cup water. Heat over medium-low heat, stirring occasionally, until the sugars dissolve. Cut the vanilla bean in half, scrape out the seed paste and add both the seed paste and the pod to the pot. Using your hands, smoosh in the plums (they’ll smash right to a pulp if they’re ripe) and discard the pits. Add a couple of the plum skins that you peeled off. Cook over low heat, stirring well from time to time, for about an hour, or until the jam has thickened and tastes intensely of plum and vanilla. Fish out the vanilla pod and the skins and discard them. Transfer the jam to a container, cover, and refrigerate until fully cooled. 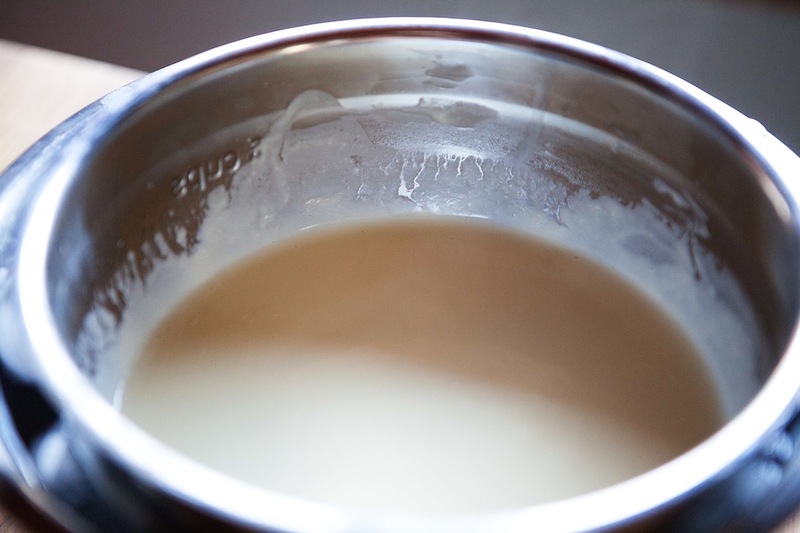 In a heavy bottomed saucepan, combine the milk, cream, 1/4 cup of the sugar, and the salt. Heat over medium until it reaches a bare simmer. 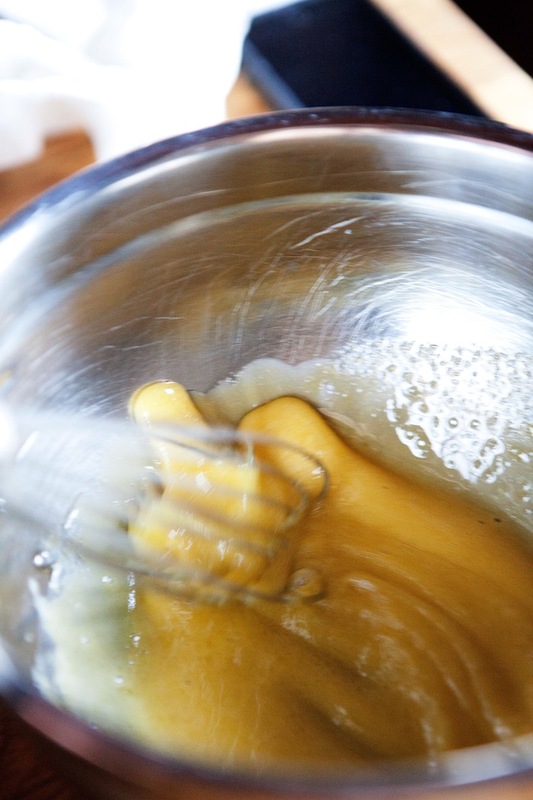 In the meantime, in a small bowl, whisk together the egg yolks and the remaining 1/4 cup sugar. When the milk mixture is hot add a ladleful to the egg yolks, whisking vigorously as you add it. Repeat with one or two more ladlefuls to temper the yolks. Then, scrape the yolk mixture back into the pot with the milk mixture. Heat over medium heat, stirring constantly, until the mixture has reached the consistency of custard (it should thickly coat the back of your stirring spoon). Transfer the custard to a metal bowl and stir in the bourbon. Then either chill the custard in an ice bath (stirring from time to time), or chill it in the fridge overnight. Process the cold ice cream base in your ice cream maker according to the manufacturer’s instructions. It should take close to 20 minutes to churn, and you want it to reach the consistency of soft serve. In the last minute of churning, add 1/4 cup of the plum jam. When the ice cream is ready, pour half of it into a freezable container. Spoon 1/4 cup of the plum jam over it. Spread on the remaining ice cream, then spoon on another 1/4 cup of the jam. Run a knife around through the ice cream to swirl the jam, but don’t over swirl or it’ll blend right in. Cover the container tightly (leaving as little space as possible – you can put plastic wrap directly on the surface of the ice cream if you wish), and put it in the freezer for a couple of hours to harden further. Allow to soften for about 5 minutes before serving. Homemade ice cream only keeps well for several days because it doesn’t have stabilizers in it, if you share with neighbors, this shouldn’t prove to be much of a problem! Welcome home. Nice to have you back. Thank you! It’s good to be here. Are you really starting a whisky distillery? The recipe sounds yummy. That’s really our plan! A small craft whiskey distillery and eventually an attached food incubator and cooking school. We’re even meeting with the mayor today to talk about it. Sounds fantastic. Let us know when your cooking school opens. I’ve always wanted to do that. Thanks for replying. 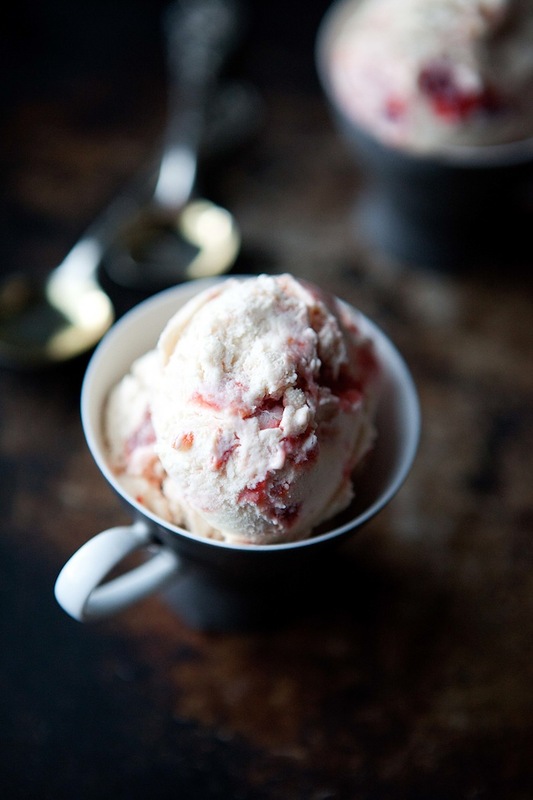 hi – this ice cream looks and sounds phenomenal – and i just happen to have everything to make it. i was wondering if it is possible to substitute half and half for the heavy cream? i am new to ice cream making but have found those recipes made with heavy cream are too ‘thick’ for me. i hope you have time to reply! Hi Janet! I have a second so I’ll reply right away. I think half and half would work just fine. The higher fat content of heavy cream helps keep the ice cream from freezing as hard and getting icy as you store it in the freezer, but if you don’t store it for too long I think it will be good. thanks! going to try this tomorrow! What a few weeks, full of excitement and adventure and it really sounds like you are welcoming the change with open arms. A perfect ice cream to start your new life with. What a few weeks indeed! Thank you. Wow, beautiful I just love plums, must say the ice cream sounds so delicious and your photo’s are beautiful. I lived under a rock this summer (not really, just spent it at an organic blueberry farm in coastal Maine without internet access), so I’m just now learning of your move. How exciting! I grew up in western Wisconsin, but I went to college in Superior and grew to love the northern Minnesota way. Maine has a very strong sense of place also, but the people just aren’t quite as nice as they are back home 🙂 It was great to read about your Big Feast last week, and I can’t wait to hear more about your new adventure. Best of luck with it all! Thanks Brianne! That sounds like a seriously awesome rock to spend the summer under! I feel like Maine and Northern MN and WI definitely have some similarities. We’re excited to be here. I’m glad you enjoyed the big feast too! It was so much fun to throw it! This sounds fantastic. Your pictures are lovely! I have to agree with Sarah — Your photos are absolutely stunning. 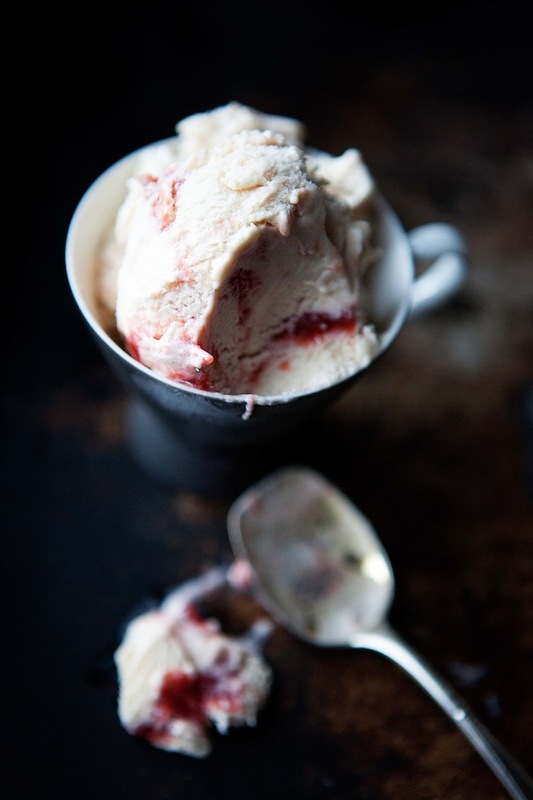 “…it was decidedly lacking in a swirl.” Ice cream, like life, is simply better with a swirl. This revised ice cream recipe reminds me of your current life revision. May it all be delicious! Love it! I totally agree! Plum and bourbon: what a perfect combination! Thanks! It was a great combo. 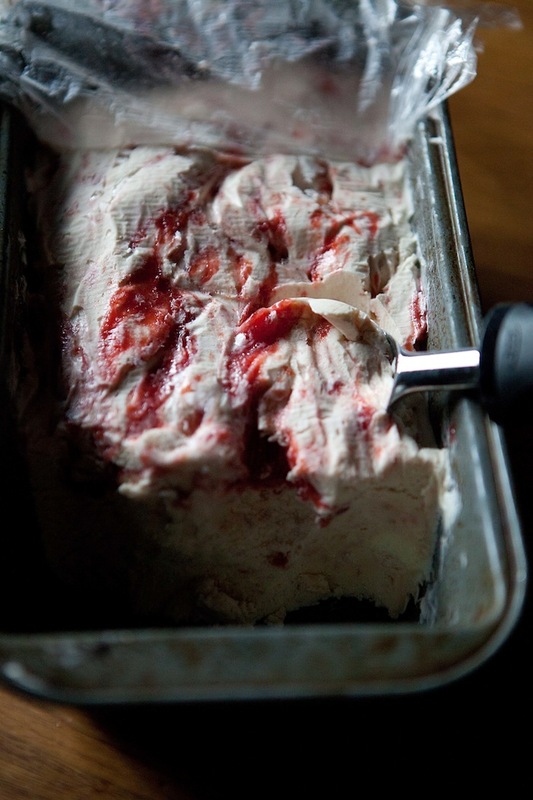 You are currently reading Plum and bourbon swirl ice cream at Five And Spice.